This article is about sand formations. Erg Awbari (Idehan Ubari) in the Sahara desert region of Fezzan in Libya. Mesquite Flat Dunes in Death Valley National Park. In physical geography, a dune is a hill of sand formed by eolian (aeolian, or wind-related) processes. Dunes can take different forms and sizes, based on their interaction with the wind. Most kinds of dunes are longer on the windward side, where the sand is pushed up the dune, and are shorter on the "slip face" on the lee side (the side sheltered from the wind). The "valley," or trough, between dunes is called a slack. A dune field is an area covered by extensive sand dunes. Large dune fields are known as ergs. Some coastal areas have one or more sets of dunes running parallel to the shoreline directly inland from the beach. In most cases, the dunes serve to protect the land against potential ravages by storm waves from the sea. 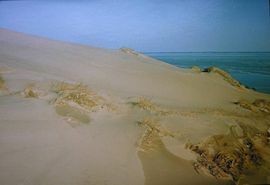 Although the most widely distributed dunes are those associated with coastal regions, the largest complexes of dunes are found inland in dry regions and associated with ancient lake beds or sea beds. Dunes can also be formed under the action of water flow (alluvial processes), on sand or gravel beds of rivers, estuaries, and the seabed. One of the main problems posed by sand dunes is their encroachment on human habitats. Sand dunes move by different means, all of them aided by the wind. Sand dunes threaten buildings and crops in Africa, the Middle East, and China. Preventing sand dunes from overwhelming cities and agricultural areas has become a priority for the United Nations Environment Program. On the other hand, dune habitats provide niches for highly specialized plants and animals, including numerous rare and endangered species. Some countries have developed extensive programs for dune protection. The modern word "dune" came into English from French, c. 1790, but it is an old, Indo-European word that is found in most of the Slavic languages as well as the Germanic and Latin languages. In ancient times, words cognate to "dune" probably had the meaning of a citadel or built-up hill fortification. A diagram showing the formation of a dune with a slipface. Crescent-shaped mounds are generally wider than they are long. The slipface is on the dune's concave side. These dunes form under winds that blow from one direction, and they also are known as barchans, or transverse dunes. Some types of crescentic dunes move faster over desert surfaces than any other type of dune. A group of dunes moved more than 100 meters (m) per year between 1954 and 1959 in the People's Republic of China's Ningxia Province; similar rates have been recorded in the Western Desert of Egypt. The largest crescentic dunes on Earth, with mean crest-to-crest widths of more than 3 kilometers (km), are present in in China's Taklamakan Desert. Straight or slightly sinuous sand ridges typically much longer than they are wide are known as linear dunes. They may be more than 160 kilometers long. Linear dunes may occur as isolated ridges, but they generally form sets of parallel ridges separated by miles of sand, gravel or rocky interdune corridors. Some linear dunes merge to form Y-shaped compound dunes. Many form in bidirectional wind regimes. The long axes of these dunes extend in the resultant direction of sand movement. Linear loess hills known as pahas appear superficially similar. These hills appear to have been formed during the last ice age under permafrost conditions dominated by sparse tundra vegetation. U-shaped mounds of sand with convex noses trailed by elongated arms are parabolic dunes. Sometimes these dunes are called U-shaped, blowout, or hairpin dunes, and they are well known in coastal deserts. Unlike crescent shaped dunes, their crests point upwind. The elongated arms of parabolic dunes follow rather than lead because they have been fixed by vegetation, while the bulk of the sand in the dune migrates forward. Longitudinal dunes (also called Seif dunes, after the Arabic word for "sword"), elongate parallel to the prevailing wind, possibly caused by a larger dune having its smaller sides blown away. Seif dunes are sharp-crested and are common in the Sahara. They range up to 300 m (900 ft) in height and 300 km (200 mi) in length. In the southern third of the Arabian Peninsula, a region called the Empty Quarter because of its total lack of population, a vast erg called Rub al Khali contains seif dunes that stretch for almost 200 km and reach heights of over 300 m.
Seif dunes are thought to develop from barchans if a change of wind direction occurs. The new wind direction will lead to the development of a new wing and the over development of one of the original wings. If the prevailing wind then becomes dominant for a lengthy period of time, the dune will revert to its barchan form, with one exaggerated wing. Should the strong wind then return the exaggerated wing will further extend so that eventually it will be supplied with sand when the prevailing wind returns. The wing will continue to grow under both wind conditions, thus producing a seif dune. 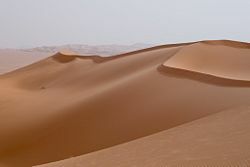 On a seif dune, the slip face develops on the side facing away from the strong wind, while the slip face of a barchan faces the direction of movement. In the sheltered troughs between highly developed seif dunes, barchans may be formed because the wind is unidirectional. A transverse dune is perpendicular to the prevailing wind, probably caused by a steady buildup of sand on an already existing minuscule mound. Complex dune: Dune 7 in the Namib desert, one of the tallest in the world. The Great Dune of Pyla is the largest dune in Europe. Sub-aqueous (underwater) dunes form on a bed of sand or gravel under the actions of water flow. They are ubiquitous in natural channels such as rivers and estuaries, and also form in engineered canals and pipelines. Dunes move downstream as the upstream slope is eroded and the sediment deposited on the downstream or lee slope. These dunes most often form as a continuous "train" of dunes, showing remarkable similarity in wavelength and height. A lithified (consolidated) sand dune is a type of sandstone that is formed when a marine or aeolian sand dune becomes compacted and hardened. Once in this form, water passing through the rock can carry and deposit minerals, which can alter the hue of the rock. Cross-bedded layers of stacks of lithified dunes can produce the cross-hatching patterns, such as those seen in Zion National Park. A local slang term used for these consolidated dunes is "slickrock," a name used by pioneers of the old west because their steel-rimmed wagon wheels found it difficult to gain traction on this rock. Coastal dunes on the Kurnell Peninsula. Dunes form where "constructive waves" encourage the accumulation of sand, and where prevailing onshore winds blow this sand inland. There is a need for obstacles (for example, vegetation, pebbles) to trap the moving sand grains. As the sand grains get trapped they start to accumulate, this is the start of dune formation. The wind then starts to affect the mound of sand by eroding sand particles from the windward side and depositing them on the leeward side. Gradually this action causes the dune to “migrate” inland; as it does so it accumulates more and more sand. These dunes provide shelter from the wind. Coastal dunes in Curonian spit. As a dune forms, plant succession occurs. The conditions on an embryo dune are harsh, with salt spray from the sea carried on strong winds. The dune is well drained and often dry, and composed of calcium carbonate from seashells. Rotting seaweed, brought in by storm waves adds nutrients to allow pioneer species to colonize the dune. These pioneer species are marram grass, sea wort grass, and other sea grasses in the UK. These plants are well adapted to the harsh conditions of the fore-dune, typically having deep roots which reach the water table, root nodules that produce nitrogen compounds, and protected stoma, reducing transpiration. Also, the deep roots bind the sand together, and the dune grows into a fore dune as more sand is blown over the grasses. The grasses add nitrogen to the soil, meaning other, less hardy plants can then colonize the dunes. Typically these are heathers and gorses. These too are adapted to the low soil water content and have small, prickly leaves which reduce transpiration. Heathers add humus to the soil, but have a pH of lower than 7, so make the soil slightly acidic. Heathers are usually replaced by coniferous trees which can tolerate the low pH. Coniferous forests and heathland are common climax communities for sand dune systems. Young dunes are called yellow dunes, dunes which have high humus content are called gray dunes. Leaching occurs on the dunes, washing humus into the slacks, and the slacks may be much more developed than the exposed tops of the dunes. It is usually in the slacks that more rare species are developed and there is a tendency for the dune slacks soil to be waterlogged and where only marsh plants can survive. These plants would include creeping willow, cotton grass, reeds, and rushes. Also, there is a tendency for natterjack toads to breed there. One way of preventing sand from accumulating in roadways is planting trees and vegetation along the road. One of the biggest problems posed by sand dunes is their encroachment on human habitats. Sand dunes move through a few different means, all of them helped along by the wind. One way that dunes can move is through saltation, where sand particles skip along the ground like a rock thrown across a pond might skip across the water's surface. When these skipping particles land, they may knock into other particles and cause them to skip as well. With slightly stronger winds, particles collide in mid-air, causing sheet flows. In a major dust storm, dunes may move tens of meters through such sheet flows. Like snow, sand avalanches can fall down the steep slopes of the dunes facing away from the winds, also moving the dunes forward. Sand threatens buildings and crops in Africa, the Middle East and China. Drenching sand dunes with oil stops their migration, but this approach is highly destructive to the dunes habitat and uses a finite resource. Sand fences might also work, but researchers are still analyzing optimum fence designs. Preventing sand dunes from overwhelming cities and agricultural areas has become a priority for the United Nations Environment Program. Sand dunes of Khongoryn Els, Gurvansaikhan NP, Mongolia. White Sands National Monument, U.S.
Indiana Dunes/Sleeping Bear Dunes National Lakeshore, Lake Michigan, U.S.
Algodones Dunes near Brawley, California, U.S.
Guadalupe-Nipomo Dunes, Central Coast California, U.S.
Oxwich Dunes, near Swansea on the Gower peninsula in Wales. The Killpecker sand dunes of Southwestern Wyoming, U.S. Dune habitats provide niches for highly specialized plants and animals, including numerous rare and endangered species. Due to human population expansion dunes face destruction through recreation and land development, as well as alteration to prevent encroachment on inhabited areas. Some countries, notably the U.S., New Zealand, Great Britain, Australia, Canada, and the Netherlands have developed extensive programs of dune protection. In the UK, a Biodiversity Action Plan has been developed to assess dunes loss and prevent future dunes destruction. Dunes can likely be found in any environment where there is a substantial atmosphere, winds, and dust to be blown. Dunes are common on Mars, and have also been observed in the equatorial regions of Titan by the Cassini probe's radar. Titan's dunes include large expanses with modal lengths of about 20-30 km. The regions are not topographically confined, resembling sand seas. These dunes are interpreted to be longitudinal dunes whose crests are oriented parallel to the dominant wind direction, which generally indicates west-to-east wind flow. The sand is likely composed of hydrocarbon particles, possibly with some water ice mixed in. Some dunes are used for dune-boarding. Sand dunes in Death Valley National Park. The image shows coppice dunes, which are formed around vegetation. A footbridge provides beach access and protects dunes. A sand dune in Namibia. Sand dunes with scattered vegetation in UAE. Parabolic dune partially stabilized by marram grass. ↑ Dictionary.com, Dune. Retrieved September 5, 2008. ↑ Jenny Hogan, Mystery of world's tallest sand dunes solved, New Scientist. Retrieved September 5, 2008. ↑ Brad Thomson, Peeking Through the Haze: Titan's Surface, part II, The Planetary Society. Retrieved September 5, 2008. Bagnold, Ralph. 1941. The Physics of Blown Sand and Desert Dunes. London: Methuen & Co.
Martínez, M.L., and N.P. Psuty. 2007. Coastal Dunes: Ecology and Conservation. Berlin: Springer. ISBN 3540740015. Packham, J.R., and A.J. Willis. 1997. Ecology of Dunes, Salt Marsh and Shingle. London: Chapman & Hall. ISBN 0412579804. Treading Lightly: Minimum Impact Dune Hiking. This page was last modified on 6 October 2017, at 16:40.